Researchers at UCSF Medical Center see a potential ally in the White House, as they develop targeted therapies for diseases like cancer. In late January, the President asked Congress for $215 million in funding to help change the way we treat disease by encouraging the U.S. health system to move away from a one-size-fits-all approach to treatment. 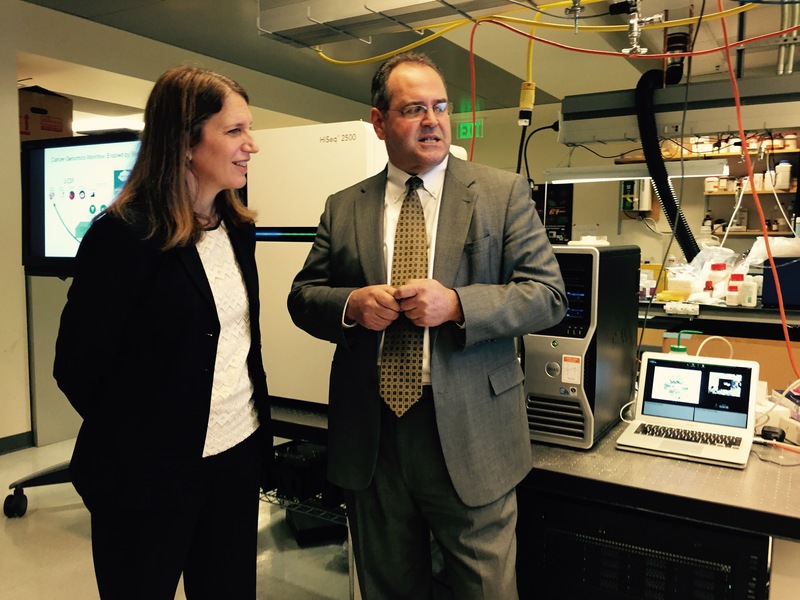 On Thursday the Secretary of Health and Human Services Sylvia Burwell paid a visit to the new UCSF Mission Bay campus to tour the research labs, and elucidate on the President’s “precision medicine” plan. 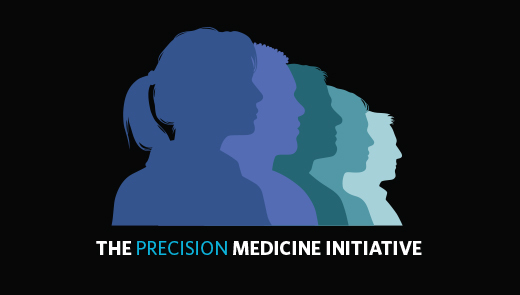 Precision medicine, also known as personalized medicine, is a developing science that takes into account each person’s lifestyle, environment, and the variability of individual genes. If Congress passes the funding request, Burwell said the initiative would invest in new treatments for cancer and look for non-invasive ways to track a patient’s response over time. The government will also fund a cancer “knowledge network,” of sorts, so data can be stored in one place and shared among doctors. The President also hopes to advance our understanding of genetics by collecting health information from one million Americans, which, the administration says, will be securely stored and only shared with researchers. “It is within our common interests to make sure that the U.S. continues to lead in this very promising field,” said Burwell, hinting at the need for a bipartisan and cross-industry approach. While some critics say the promise of personalized medicine is still more hype than reality, UCSF has charged ahead as a leader in the area. Secretary Burwell and scientists from the medical institution also met with genetic entrepreneurs and industry executives to brainstorm potential ideas, including 23andMe CEO, Anne Wojcicki and Illumina’s chief medical officer, Rick Klausner. Personal genetics pioneer, Wojcicki told KQED that other areas of focus, during private discussions with the secretary, included electronic medical records, which have limited data-sharing capabilities, and new tools for patients to take control of their care. “I advocated that we make medication history truly accessible to all individuals, as I think that foundation is critical to precision medicine,” Wojcicki said. Wojcicki is a major advocate of making health data available to patients. Her company did just that by selling a $99 consumer genetic test, until the FDA cracked down on its core product in November of 2013. Scientists at UCSF said they see cancer and traumatic brain injury as priorities for new precision medicine projects. “I still treat it [traumatic brain injury] the way my predecessors did 100 years ago,” said Geoffrey Manley, who specializes in traumatic brain injury at UCSF. But Manley’s team recently received $17 million from a group of public and private funders, including the Department of Defense, which it is using to identify new treatments for traumatic brain injuries. About 2 percent of the U.S. population suffers from disabilities caused by brain injuries, according to the Centers for Disease Control and Prevention. Dr. Manley also said the medical world needs to move beyond classifying traumatic brain injuries as mild, moderate and severe. “Can you imagine calling cancer mild, moderate or severe? So clearly we have a precision medicine problem," said Manley. During her visit, Burwell also stopped by the lab of UCSF’s medical geneticist Dr. Robert Nussbaum, who hopes to identify cancer patients for more targeted therapies, rather than common treatments such as chemotherapy. Dr. Nussbaum has already been working with some promising startups, like Syapse, for precision medicine initiatives. Syapse develops software for oncologists to dig into the genomic profile of cancerous tumors, and use that information to more effectively treat the disease. Those who met with Burwell said the timing is right to improve patient care by taking advantage of recent technological advancements. “If we were to have followed Moore’s law, a human genome would have been 500 times more expensive and 250 times slower,” said Illumina’s Klausner. San Diego based Illumina recently announced that it could sequence the human genome for $1,000. “We will see a new type of medicine, and it will be dramatic," said Klausner.